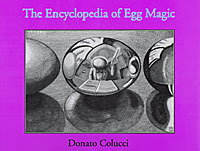 Today, when you order "Encyclopedia of Egg Magic by Donato Colucci - Book", you'll instantly be emailed a Penguin Magic gift certificate. You can spend it on anything you like at Penguin, just like cash. Just complete your order as normal, and within seconds you'll get an email with your gift certificate. 319 large pages containing more than 270 tricks and routines gathered form hundreds of sources, plus nearly 50 more articles pertaining to the performance of uncommon and amazing things with the common and humble egg, supplemented by over 490 illustrations by J.K. Schmidt. Of special note is a wealth of material for the parlor and stage magician. This is indeed an "encyclopedia'. Discusses historical egg props and routines as well as current offerings. Gives directions for purchasing items not obsolete or only on collector's lists. Never considered an entire "Egg Act" but this book makes you think about such a presentation.